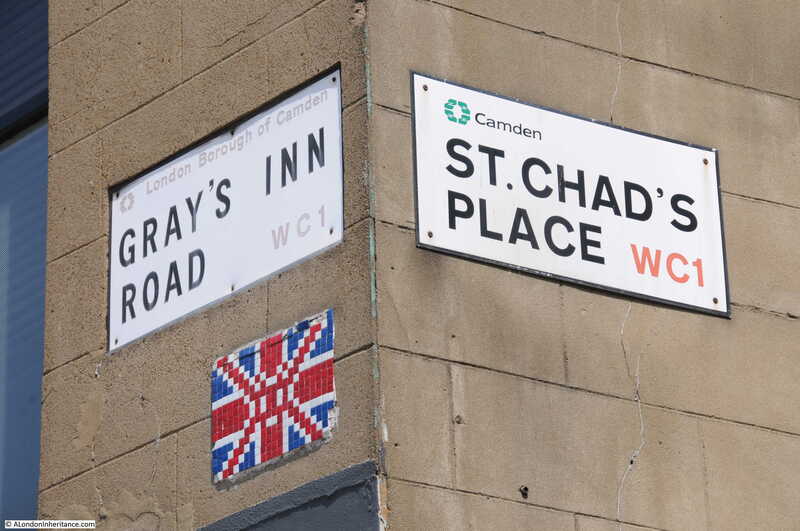 The fascination of walking in London is that you can turn off a busy street and discover a completely different place, somewhere with a very unique character and history. For this week’s post, I went to find if an old shop front had survived from the 1980s and found the unique Lloyd Baker Estate. The following photo is one of my father’s photos from 1986. 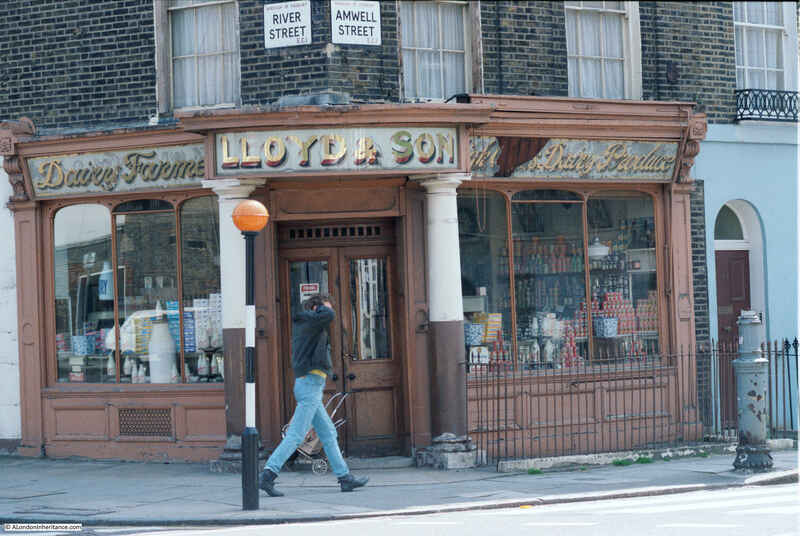 It shows the dairy shop of Lloyd and Son on the corner of River Street and Amwell Street. 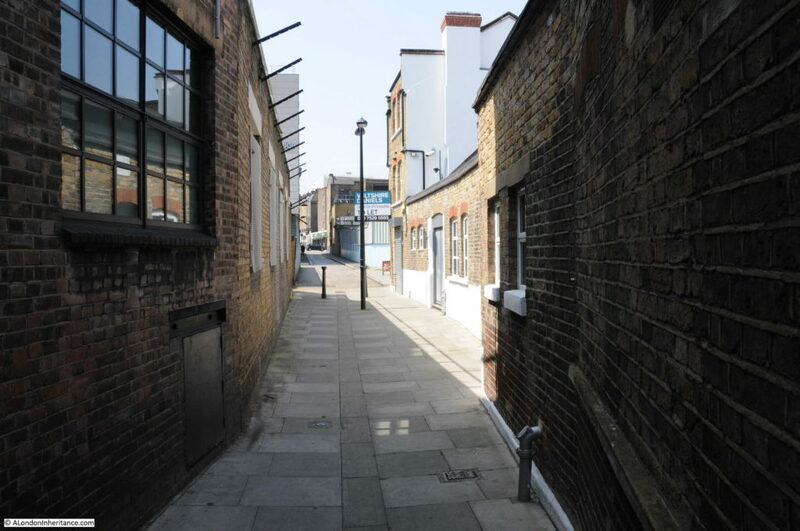 Amwell Street runs from Rosebery Avenue in Clerkenwell to a short distance from Pentonville Road. 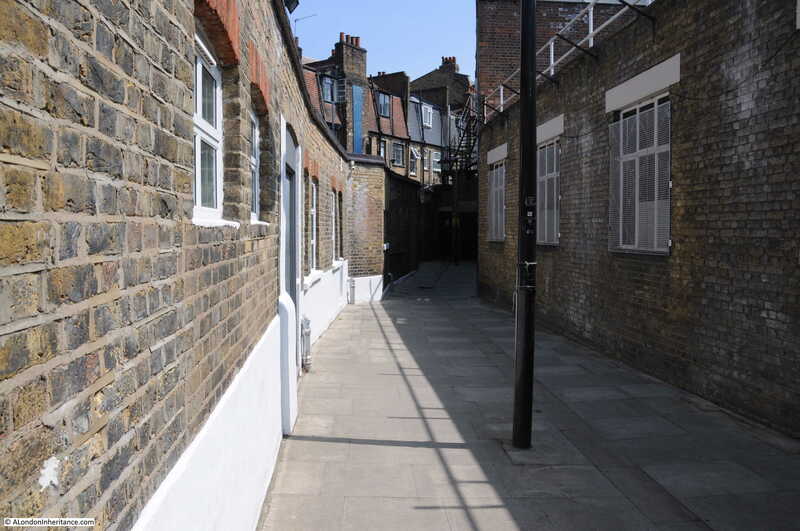 Development of Amwell Street took place during the first couple of decades of the 19th century, partly on land owned by the New River Company. 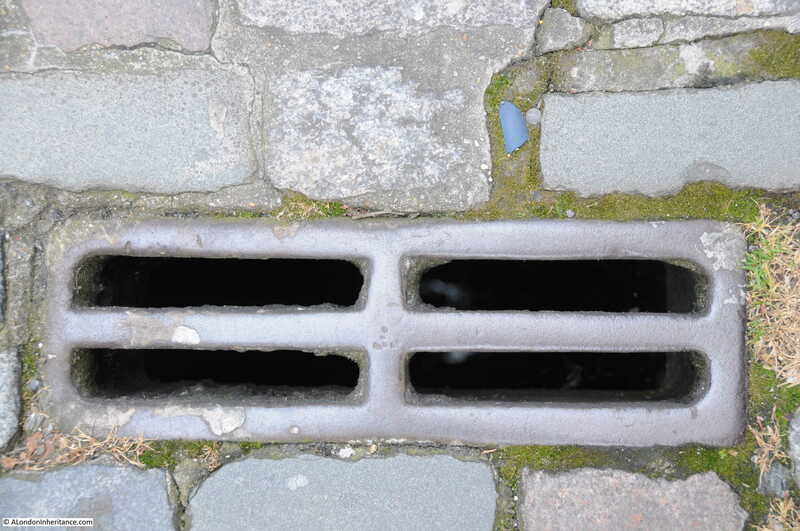 The New River Company was the 17th century company formed to build an artificial river to bring in water from the north of London to feed the ever growing need for water of London’s rising population. The New River Head where the company’s reservoirs were located is a short distance from the location of the shop. River Street was named after the New River and Amwell Street after Amwell in Hertfordshire through which the New River ran, and where some of the springs that fed the river were located. The history of the New River Company, traces of the company around Clerkenwell and where the river can still be found are hopefully subjects for future posts. 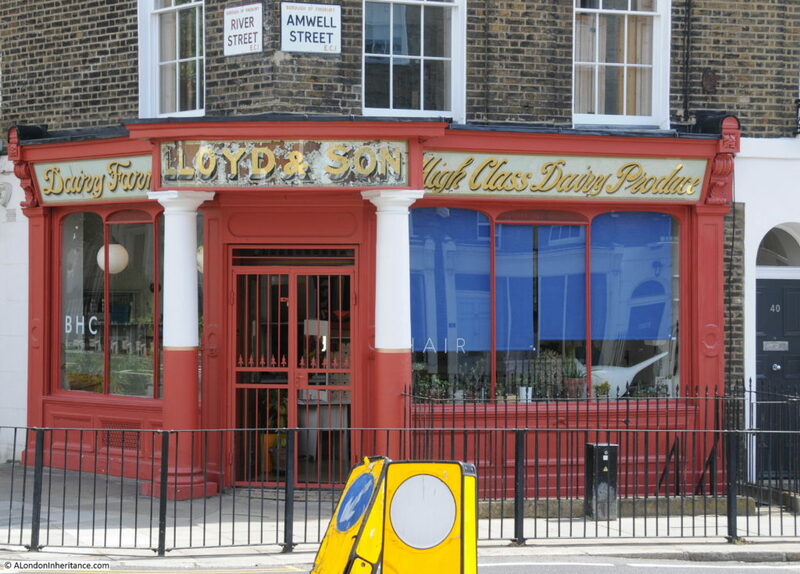 The Lloyd’s Dairy business opened on the corner of Amwell Street and River Street in 1905. I cannot find the year when the business closed, but I believe it was in the late 1990s. The same view in 2017. The shop is now occupied by the saloon of BHC Hair. 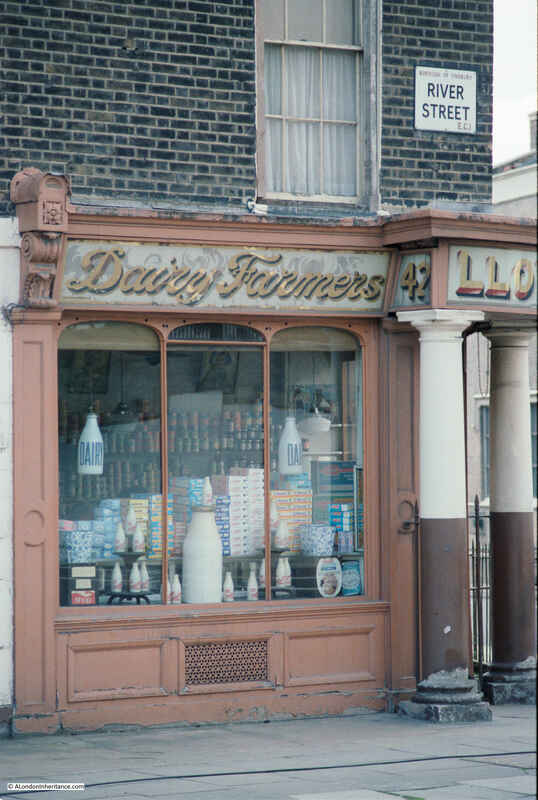 A close up of the shop window in 1986. Piles of cereal boxes and the milk bottles used to advertise the business. 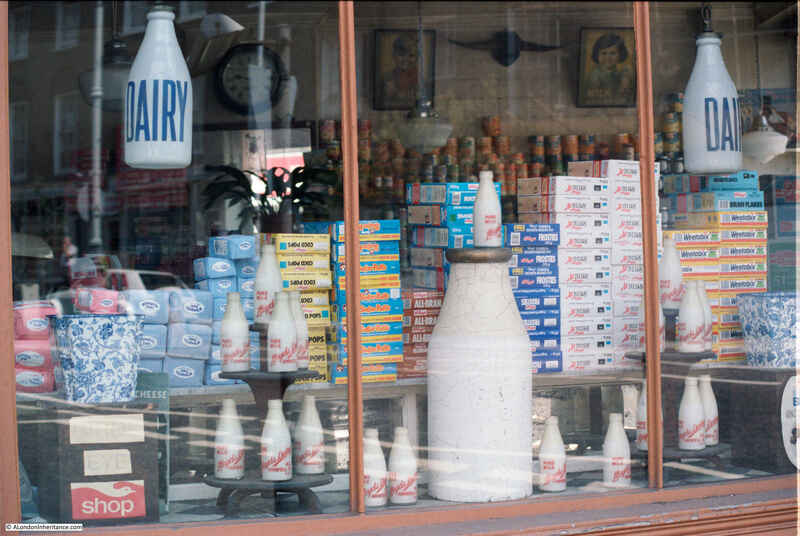 On the far side of the shop are rows of tinned fruit and above are a couple of posters with a boy and girl advertising milk. 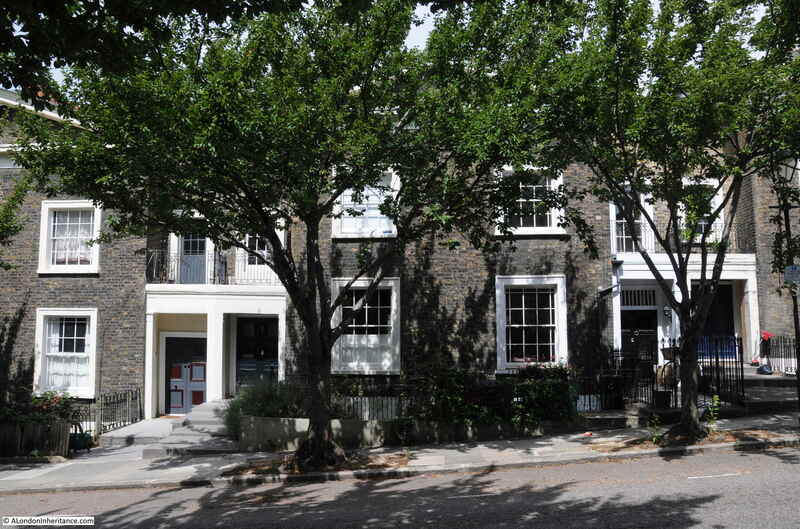 The shop is located in the end building of a terrace of early 19th century houses. There were once so many corner shops across London. The majority do not retain their shop front, but it is still possible to see traces of the original shop on the corners of 19th century streets. 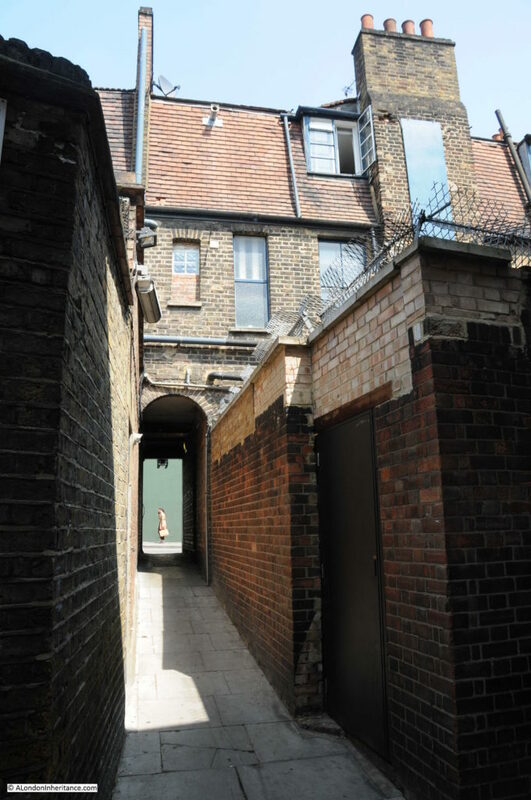 At the top of the brick walls on the corner of the building there is a layer of light coloured brick. 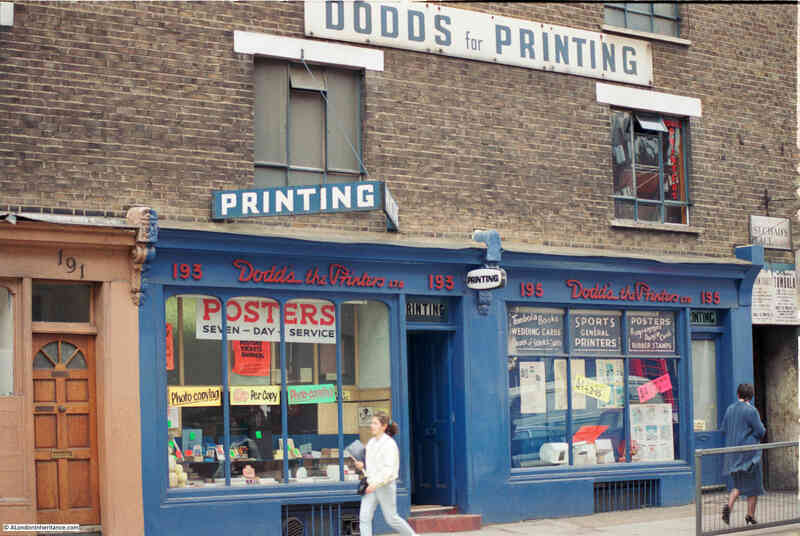 I found the following photo in the London Metropolitan Archives Collage archive showing the building in 1973. 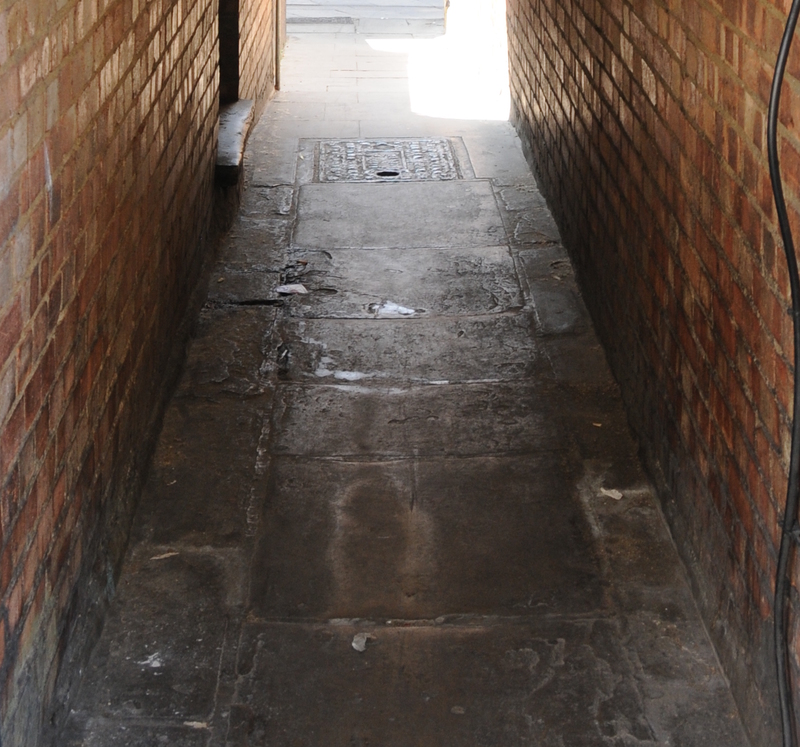 The reason for the lighter coloured brick layer is now clear, as it was once covered by a large advertising sign for the dairy. 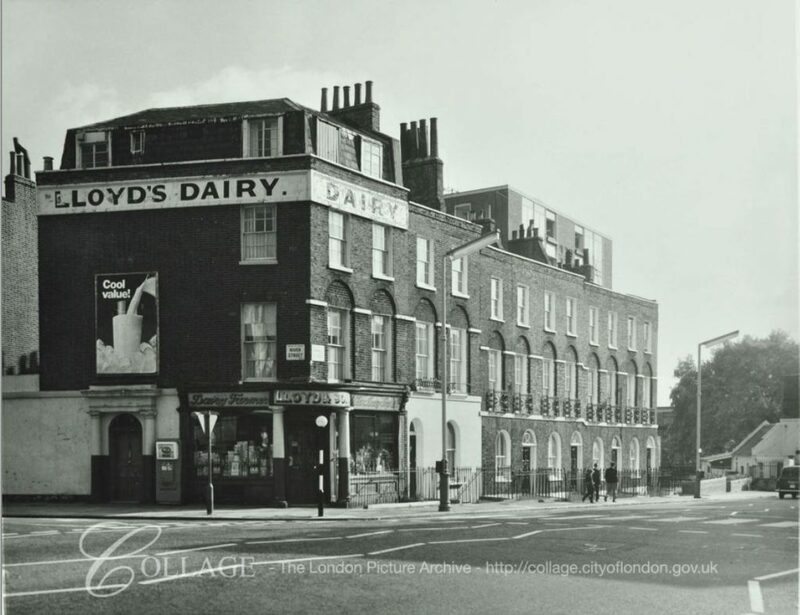 I had walked to find Lloyd’s Dairy from King’s Cross Road. The map extract below shows the location of the dairy marked by the orange circle in the top right. River Street runs from the location of the dairy to the top right. 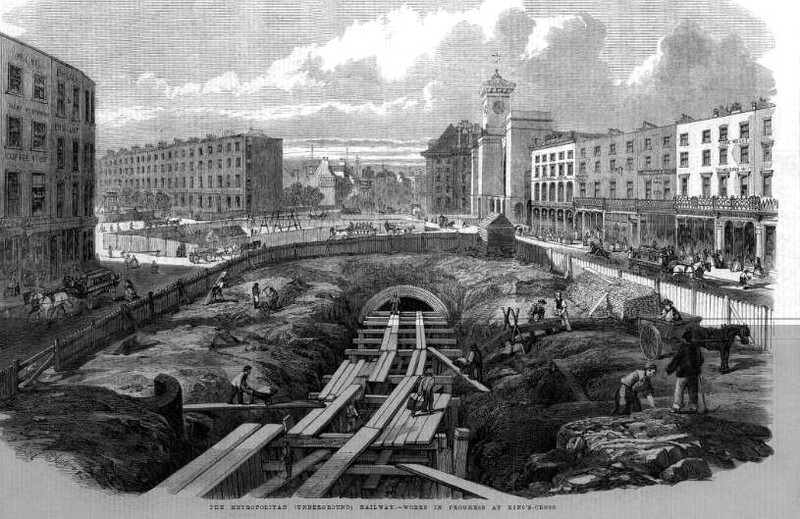 the old New River Company reservoirs were just below River Street. King’s Cross Road is the orange road from lower centre to top left of the map. Much of the area between the location of the dairy and King’s Cross Road is occupied by the Lloyd Baker Estate. The Fleet River ran along and slightly to the west of King’s Cross Road and the above ground evidence that a river once ran here in a valley can be seen looking up past the the Union, up Lloyd Baker Street where the land rises rather steeply (for central London) away from King’s Cross Road. Lloyd Baker Street is lined with some rather uniquely designed villas. 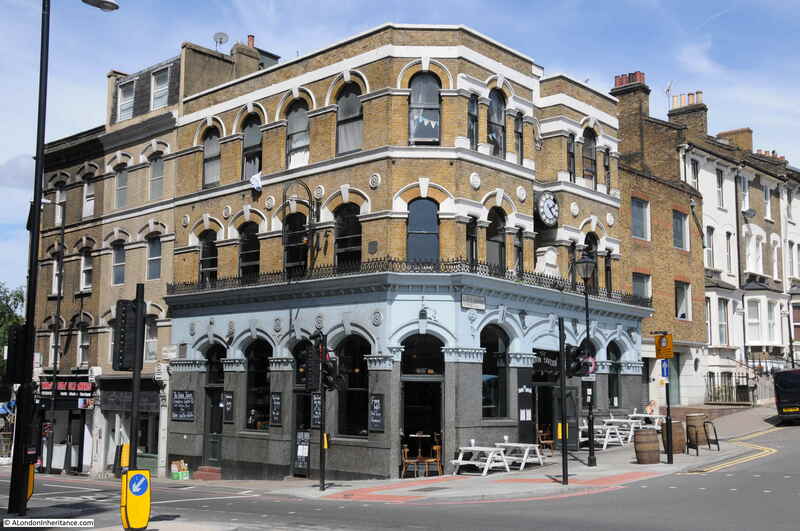 The original ownership of the land between King;s Cross Road and Amwell Street was through a series of individual owners and the New River Company. In the late 17th century, a Dr William Lloyd became owner of part of the land. 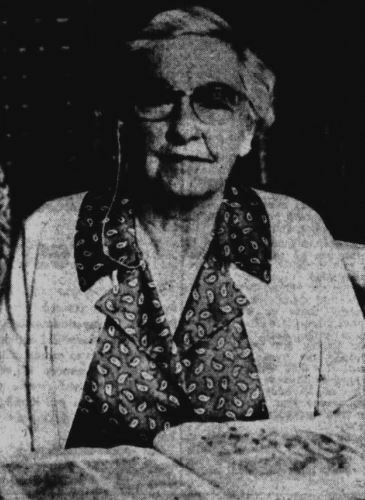 Ownership continued through a couple of generations of the Lloyd family to Mary Lloyd, a daughter of John Lloyd. Mary married a Reverend William Baker who added the name Lloyd to his surname to form the hyphenated name Lloyd-Baker in the late 18th century. 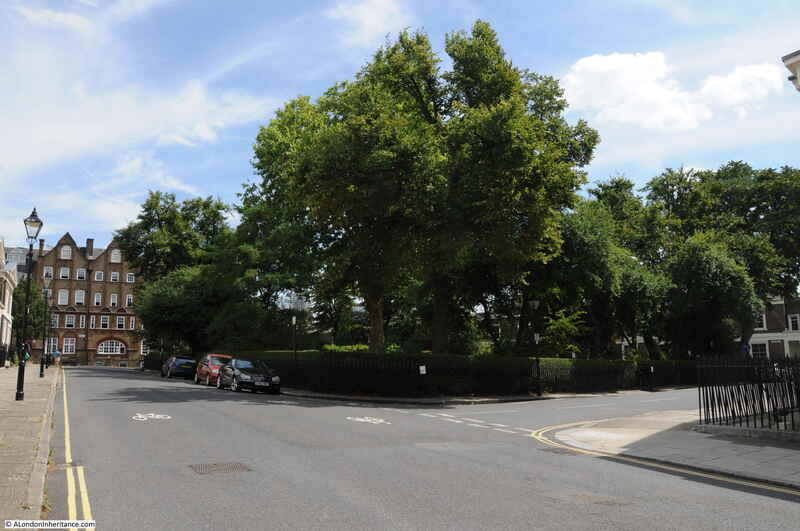 William Lloyd-Baker started some development in the area, but it was not until around 1820 when major development of the area commenced with the next generation of the Lloyd-Baker’s. 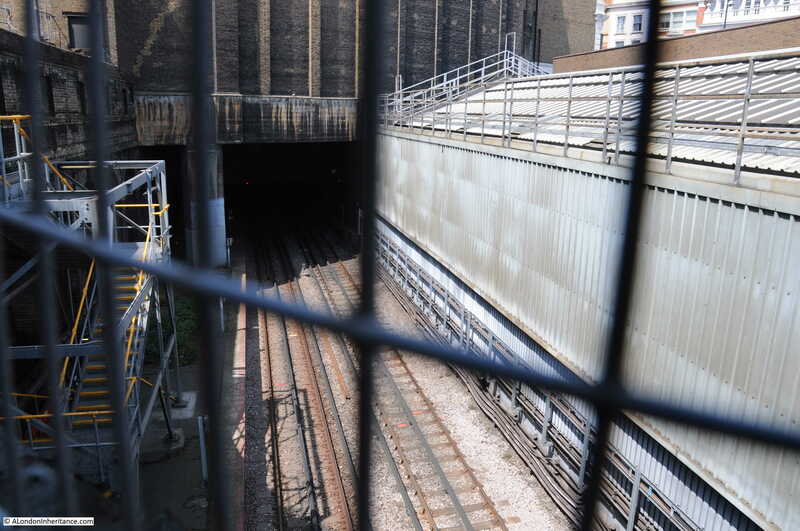 Work started with the redevlopment of the Union around 1819 and then continued across the area between King’s Cross Road and Amwell Street, with work being mainly complete by the early 1840s. The Lloyd-Baker family continued to own the estate after construction had completed and the area was known as the Lloyd Baker Estate. 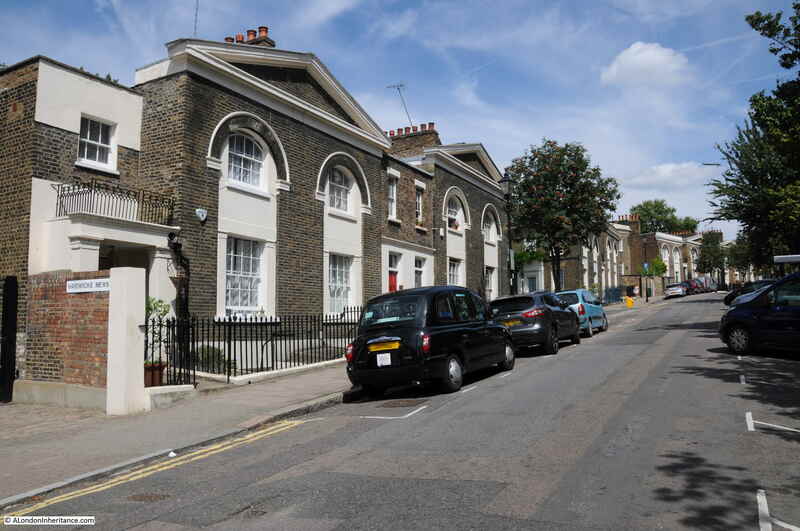 Architectural styles vary between reasonably traditional terrace housing and the villas which can be found in Lloyd Baker Street and Wharton Street. The above photo shows the unique style of the villa and also the stepped layout of the buildings to accommodate the rising height as the villas ascend the street. The development included a couple of squares. 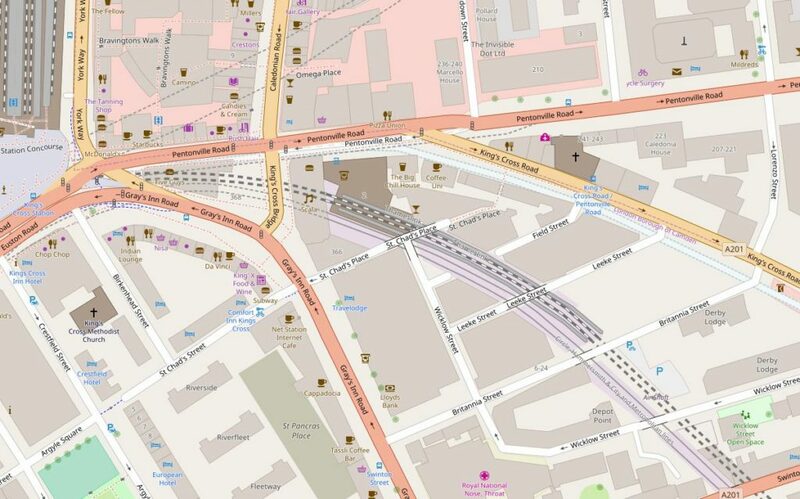 Granville Square between Wharton Street and Lloyd Baker Street, and at the top of the two streets, Lloyd Square. This is the view looking across the square from the top of Wharton Street. 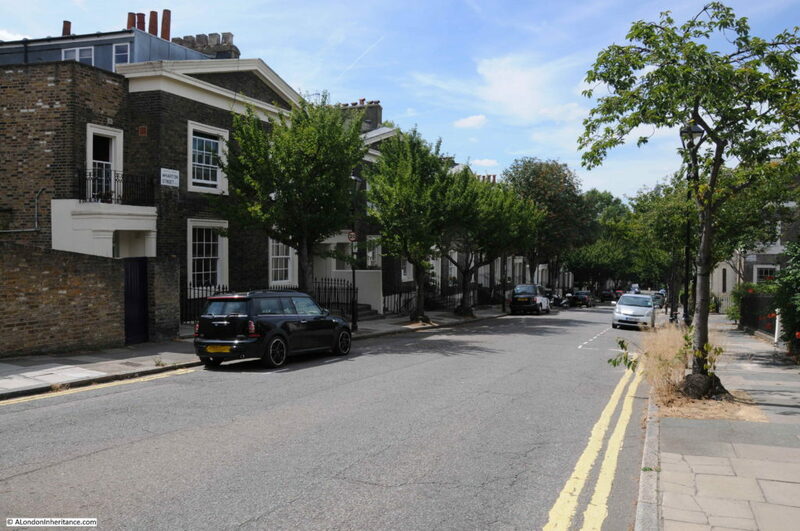 Bordering Lloyd Square are more villas, but here the land is flat after ascending roughly 42 feet from King’s Cross Road (which I know is a trivial rise in height, but these are central London streets). 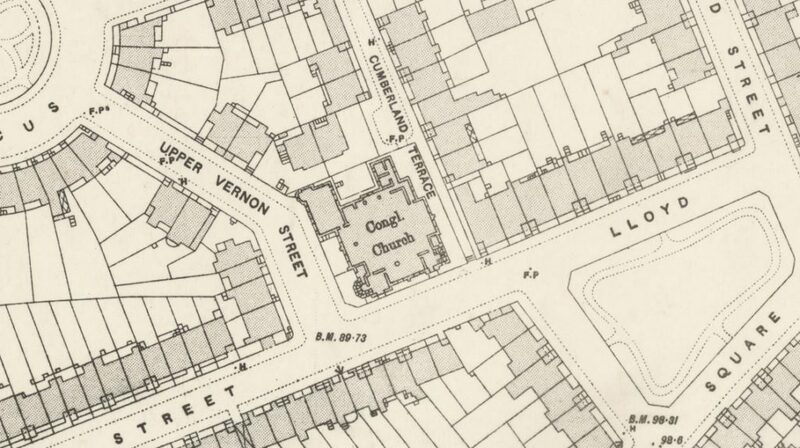 Nairn provides a perfect description of the Lloyd Baker Estate. 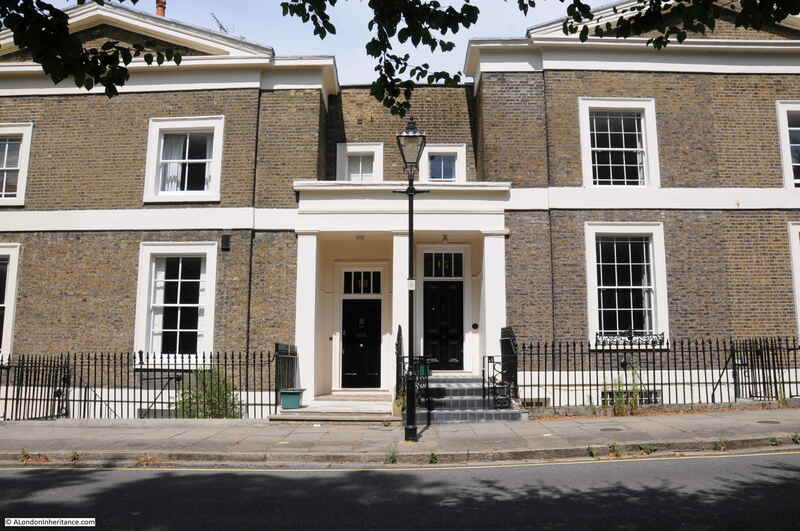 After the noise and traffic on King’s Cross Road, it is the quiet along with the flicker of leaves in the sunlight, and the doorways at different heights within a pediment that attempts to retain an impression of the same height for the two doorways. 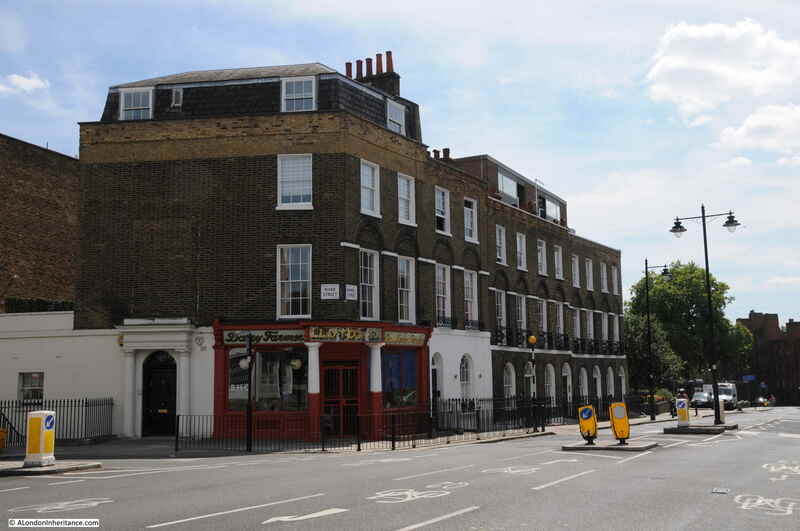 The eastern edge of Lloyd Square has a very different building to those lining the other three sides. 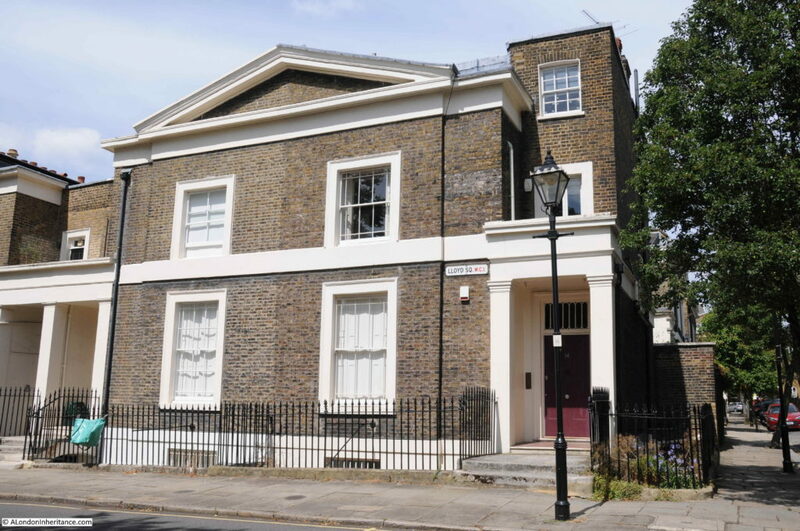 This is the House of Retreat built by the Sisters of Bethany in the first half of the 1880s. 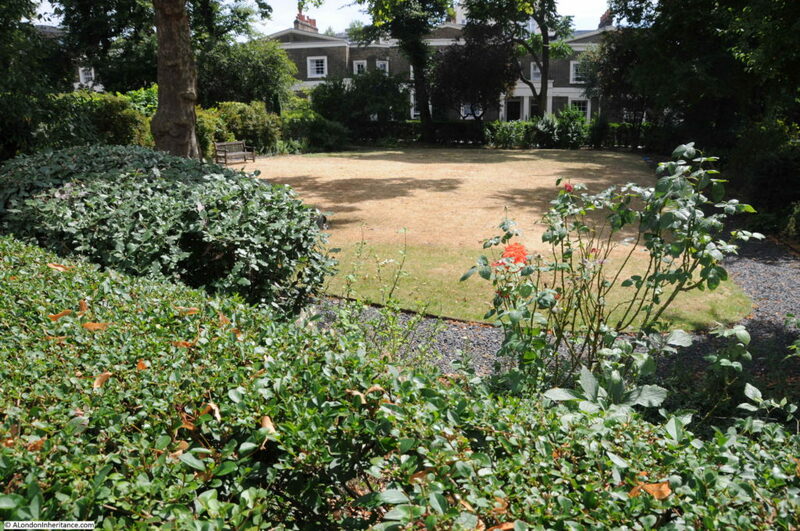 This side of the square was lined by the original villas, however the Lloyd-Baker family allowed these villas to be demolished for the House of Retreat. This is the terrace of houses along one side of Lloyd Baker Street that leads from the square to Amwell Street, opposite the original Lloyd’s Dairy shop. 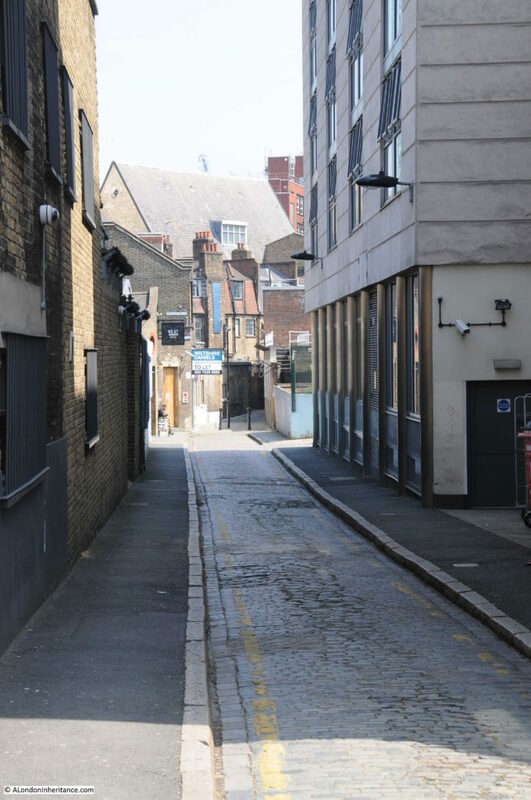 One of the problems I have when taking photos of buildings in London is that there are often cars lining the length of a street and obscuring the ground floor of a building. 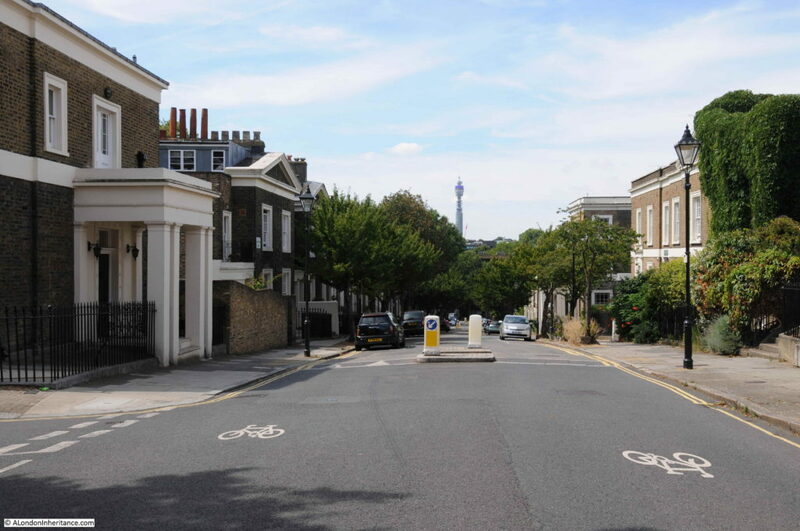 There are cars parked on the streets of the Lloyd Baker estate, but there are considerable lengths of the streets with no cars, and some lengths are protected by double yellow lines. 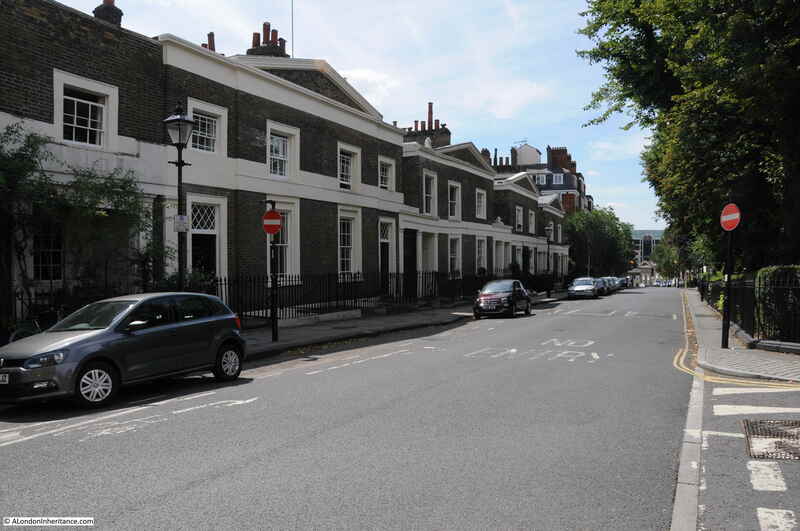 It makes for a very pleasant set of streets to walk, and to admire the buildings along the streets. King’s Cross Road and Amwell Street border the Lloyd Baker Estate. 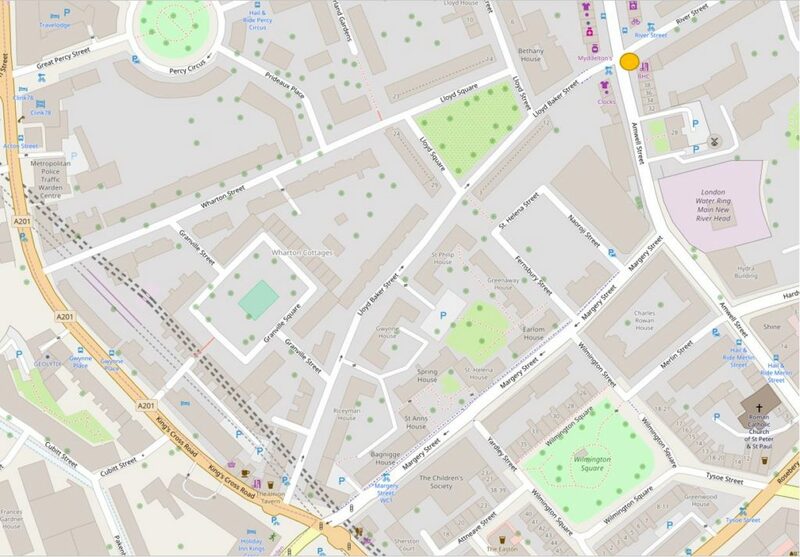 Both these streets run north to south, so there is no real reason for traffic to cut through the estate. This lack of traffic and nose to tail parked cars also contributes to the unique feeling of the estate. 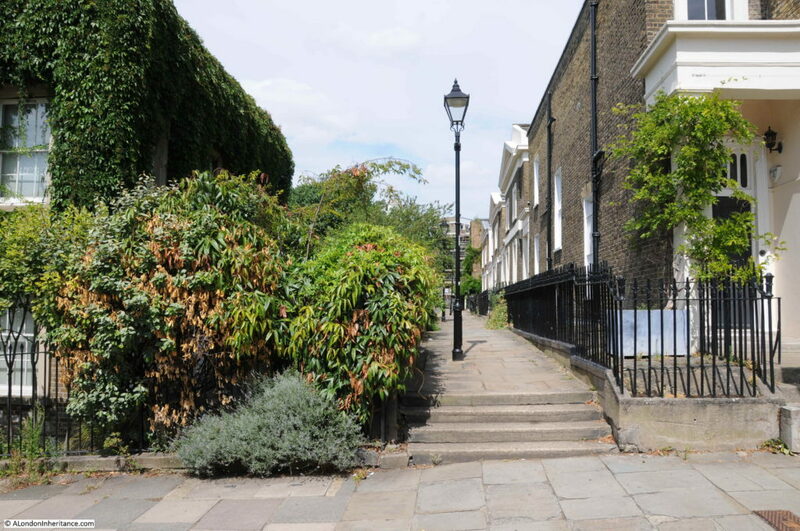 As well as the streets leading of from Lloyd Square, a short distance down Wharton Street from the square, an alley leads into Cumberland Gardens. 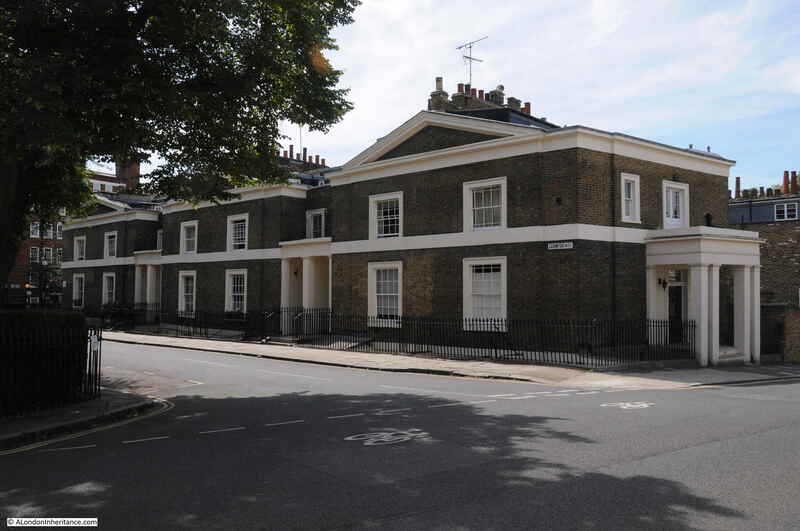 also part of the Lloyd Baker estate with the same distinctive buildings. The name of the house is a reference to the archery target ground that occupied part of Wharton Street in the early years of the 19th century, before the start of the main construction period of the Lloyd Baker Estate. 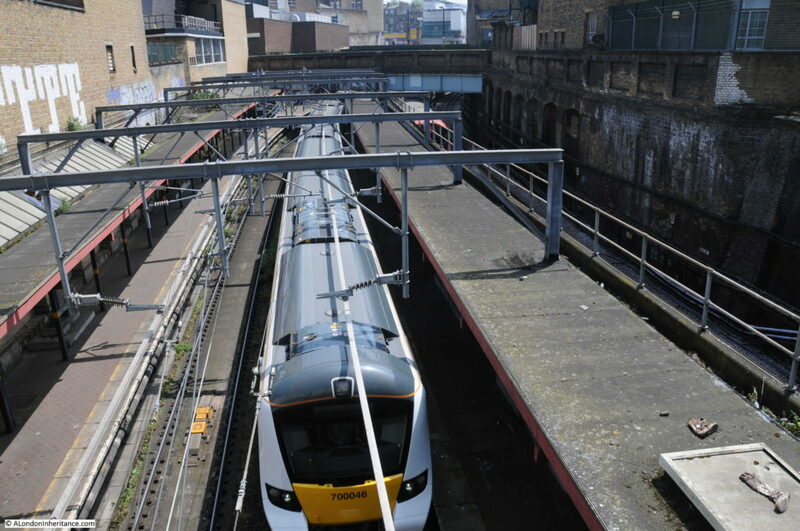 Another project that involved significant demolition of part of the estate was the construction of the original Metropolitan Railway, built between 1859 and 1862, which ran from Paddington to Farringdon. 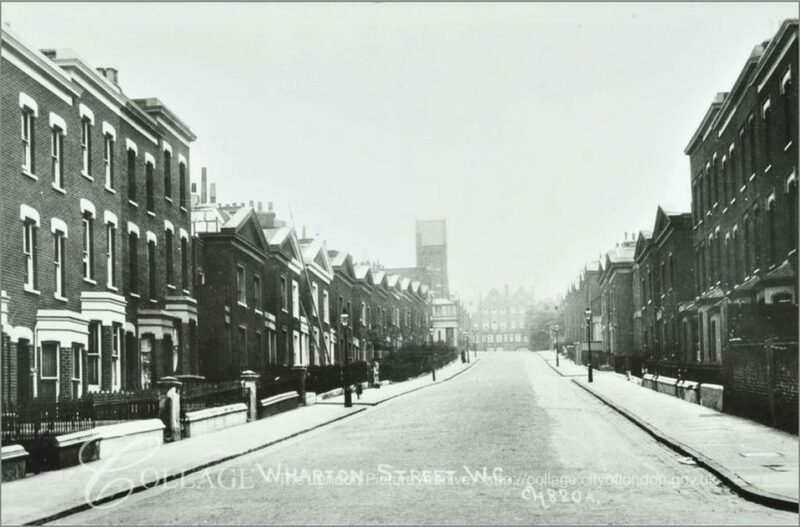 This involved demolition of houses at the King’s Cross Road end of Wharton and Lloyd Baker Streets. If you look back at the 1910 photo above, you can see houses on the right and left of the photo, closest to the photographer. 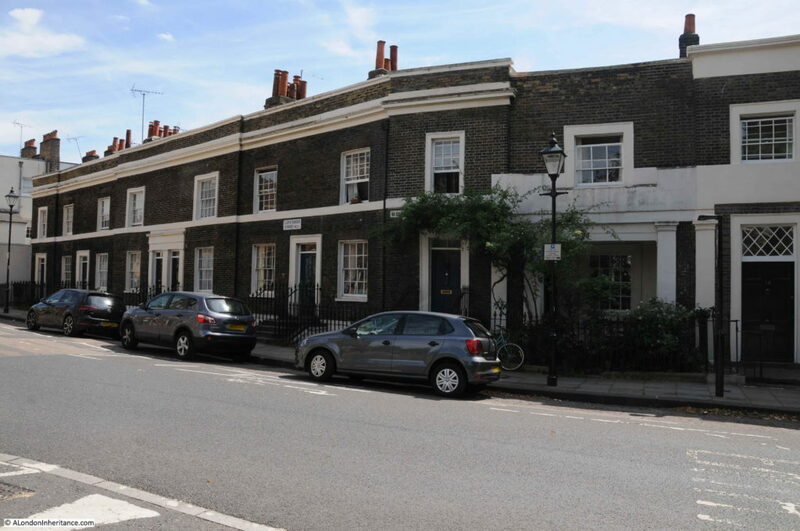 These are houses built to replace those demolished during the construction of the railway. 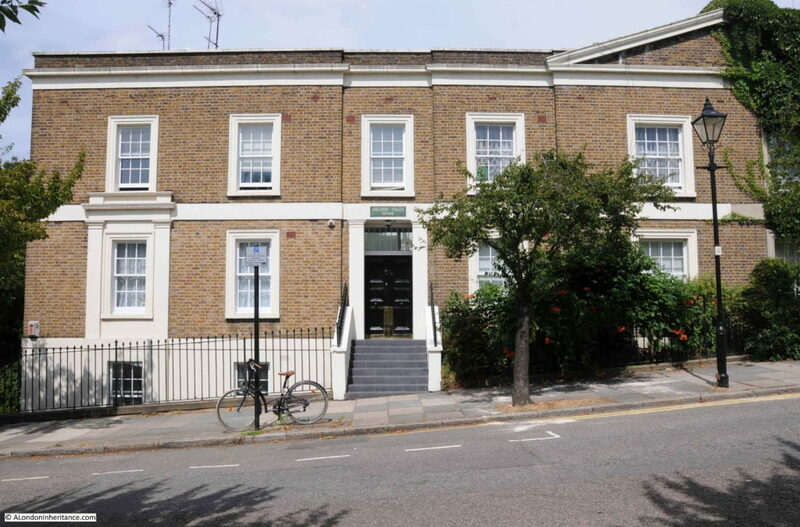 After Olive’s death, the estate was broken up with Islington Council purchasing a large number of properties, others sold to private buyers, with the Lloyd Baker Estate retaining a much smaller number. 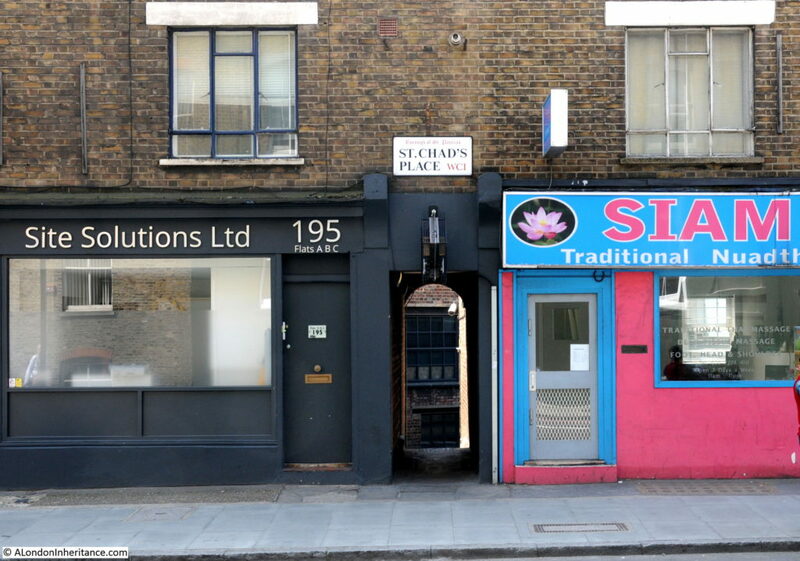 One of the buildings in Wharton Street with coloured doors, again showing the way the buildings manage the height change as the street descends towards King’s Cross Road. 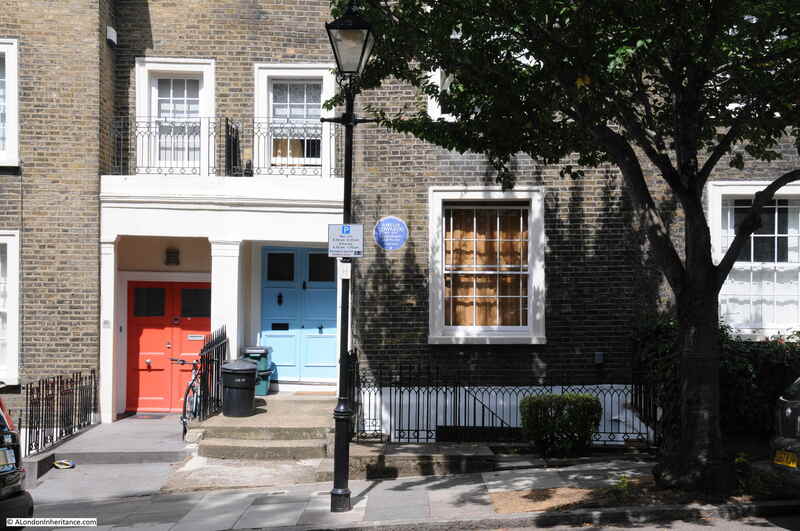 One house of the pair has a blue plaque recording that Amelia Edwards, Egyptologist lived in the house. 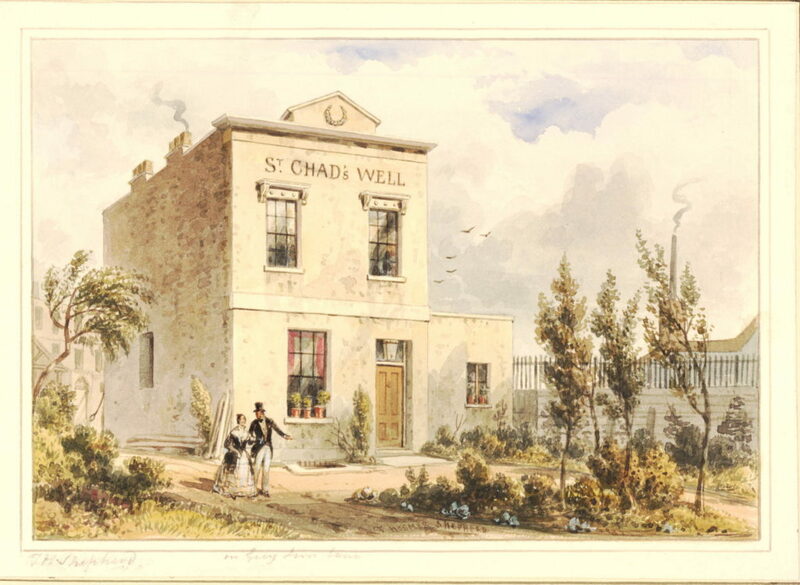 Amelia Edwards was a 19th century novelist and author of travel books which she would also illustrate. After a visit to Egypt she became fascinated by the ancient history of the country and the threats to the archaeology and monuments that could be found across the country. She wrote about her travels in Egypt and in 1882 also helped set-up the Egypt Exploration Fund to explore, research and preserve Egypt’s history. 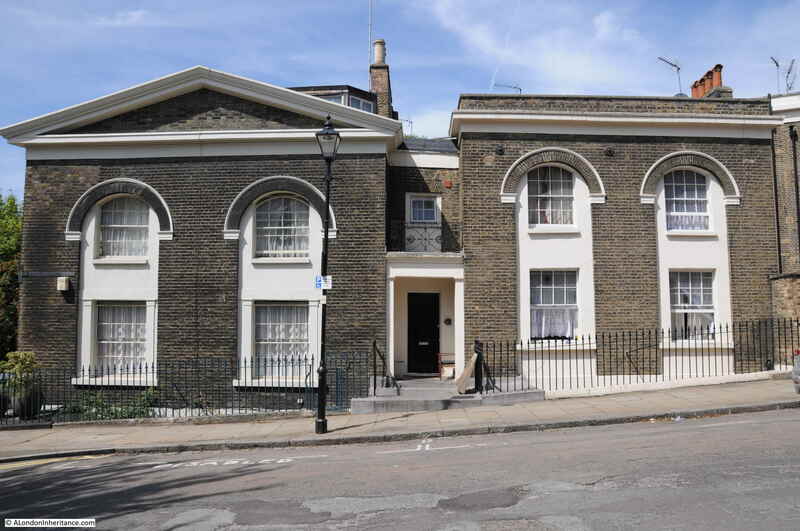 The fund is still going today as the Egypt Exploration Society, continuing to be based in London at Doughty Mews. 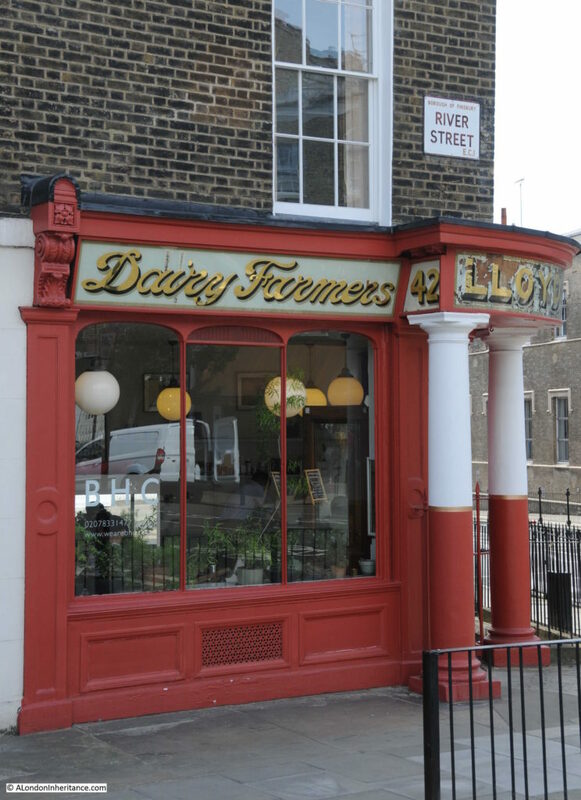 It was a fascinating walk around the Lloyd Baker Estate, and also finding Lloyd and Son’s Dairy shop front still in place in Amwell Street. There is more to the estate than I have been able to cover in a single post. 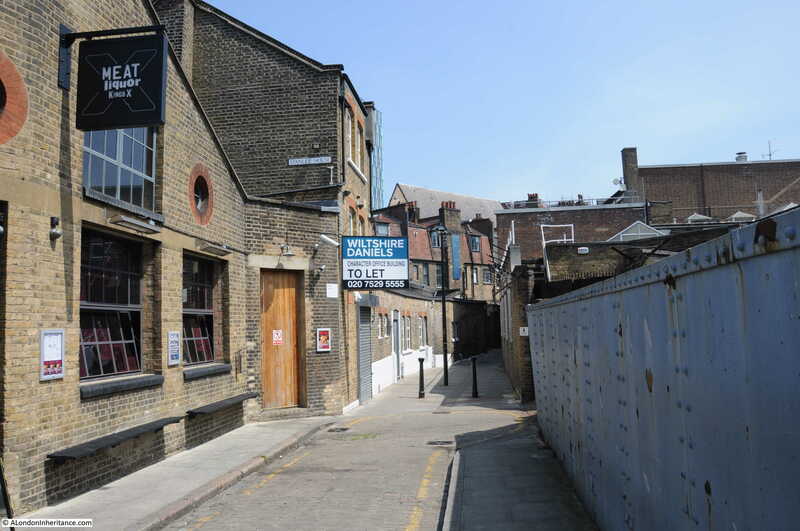 The now demolished church in Granville Square, the steps leading from Granville Square down to King’s Cross Road and their literary associations. The New River Company is also in the background to the areas history which I hope to explore in the future. What I like about the Lloyd Baker Estate is that the buildings have been designed to work with the physical features of the land. 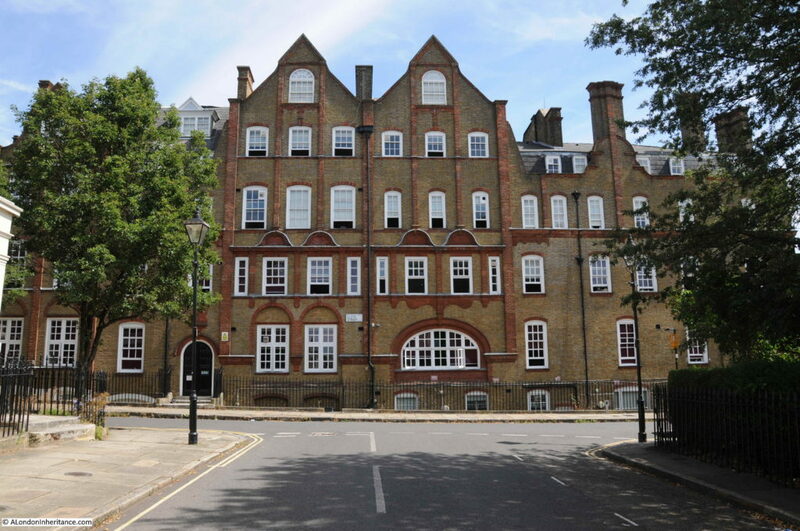 Standing in these streets, it is easy to visualise the high ground where Lloyd Square now stands, with the land then descending down to where the River Fleet once ran just to the west of King’s Cross Road – all to be seen in the doorways as the terraces move up and down the street. 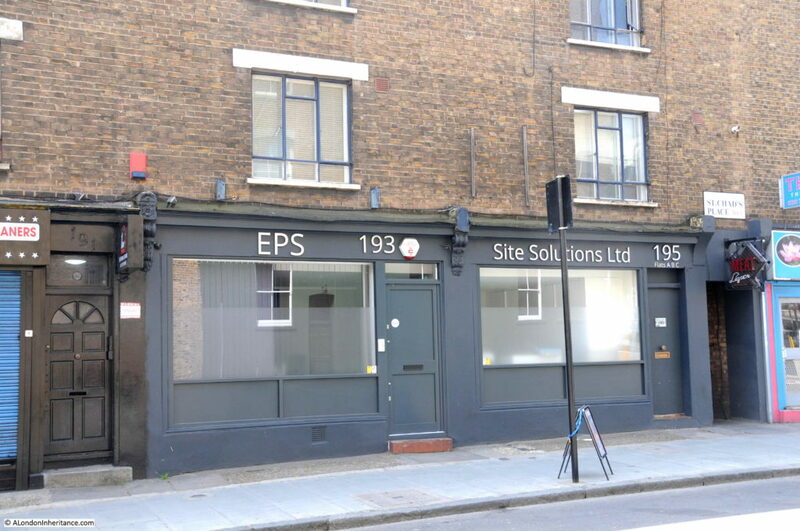 This entry was posted in London Buildings, London Streets and tagged Amwell Street, King's Cross Road, Lloyd Baker Estate on August 12, 2018 by admin.